In August, my family and I are moving to a new apartment in Berlin. This new place really feels like home—Lennon will have his own room, I will get an office and sewing space, there is a big, beautiful bathtub, an updated kitchen, and the building’s live-in owners—who happen to be friends of ours with a child Lennon’s age—are planning on installing grass and a swing set in the private Hof out back. Our new apartment really answers several requests I have flung out into the universe over the past two years. I feel incredibly lucky to have the stars align in such a way to provide us with the perfect home at the perfect time. Be careful what you wish. The night after viewing the new place, falling in love with it, and determining that we could in fact afford it, I tossed and turned in bed, haunted by an aching anxiety. Our current apartment has always been a temporary one. We’ve done a lot of cosmetic fixes to make it livable and a space we’re proud of, but it’s lack of a bathtub—shower only—and it’s single bedroom, made us know that we couldn’t stay here forever with a child. This neighborhood isn’t our ideal, either. Calling it trashy is being kind. 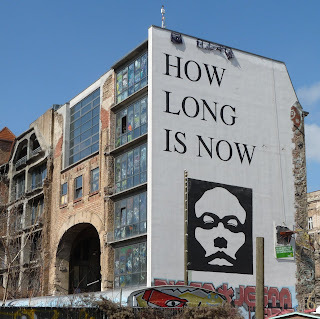 We’ve been passively looking for a new place for about a year, so finding the ideal one now didn’t come as a surprise, but the reality of moving into a more long-term home brought to the surface how attached I’d been to ‘temporary,’ at least as far as Berlin is concerned. Nicholas and I have always talked about how Berlin is the right choice for us now—how ever long now decides to be—with his teaching becoming increasingly more fulfilling, my PhD in progress, the great healthcare in Germany, the benefits here for raising a child, and Berlin’s international schools. Someday, we’ll return to the U.S., but armed with a truly compelling reason to leave Berlin. I have agreed with all these plans and believed them, but when given a brick and mortar version of not-so-temporary Berlin, I realized I’d been in denial. Secretly, in my heart, I saw my family back in the U.S. much sooner than our plans. Because this wasn’t really a conscious, well thought-out vision, the logistics of leaving Berlin were not included. Leaving now, or anytime in the near future, would result in painful sacrifices for us—me not finishing my PhD or being able to stay home to care for our son, for example. Nonetheless, I have been resistant to fully embracing our life here. To be fair, Berlin can be rough: not fully knowing the language, the dreary winters, and the general culture shock of living in a foreign country validate my hesitation to jump right in. But how can you truly embrace and immerse yourself in a city when your heart is secretly living somewhere else? I probably wasted a lot of time in Berlin giving it the ‘temp’ treatment, but I’m ready to change. Don’t dwell on the past or worry about the future for too long. Yeah, that about sums it up. The good news is, you get used to living with that after 10 years or so. It doesn't go away, but you get a bit more used to it. A bit. I love you. And this piece is perfect. We are about to begin our new beginning. Cecile, I think I've lived most of my life in the future, which always makes the present, no matter how wonderful, a little dull. As I said, it's time for a change! Love your words, especially the last three sentences. Amy is a native Californian who started her family with husband Nicholas in Berlin Germany. After giving birth to a son in 2011 and a daughter in 2013, Amy returned with her family to the SF Bay Area and began work in her dream job as an Arts Educator. In her pre-Mama life, she ran theatre companies, performed, designed costumes, and worked in arts administration. She writes about motherhood, making, DIY craftiness while sorting through the messy, imperfect, chocolate stained world of a woman approaching the good years.